The November issue kicks off with a whole host of exciting projects for you to make, including Mark Sanger's decorated lidded urn; Chris West's combo pepper grinder & salt shaker; Philip Greenwood's pestle & mortar, which is made using only basic tools; Andrew Potocnik makes a pod brooch; Nick Arnull shows you how to make a variety of craft fair alternatives, and Paul Hannaby turns a charming ring box. In our techniques section, we have brand new series by Richard Findley called 'Turning Technical', and this month he explores the turning tools of the trade. Kurt Hertzog also debunks some turning myths and encourages you to follow your instincts. 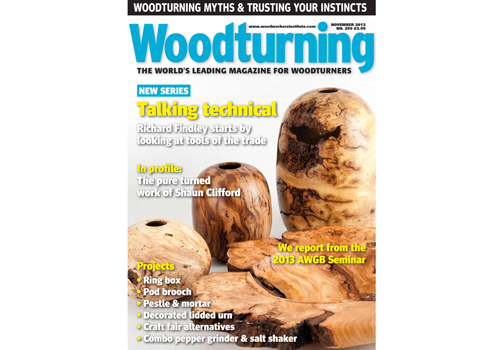 Our features section includes a special report from the 2013 AWGB Seminar, a profile on pure woodturner Shaun Clifford, and our featured artist is Pascal Oudet, with one of the new pieces he showed at the recent Seminar. Our kit & tools section has undergone a revamp and this month includes a range of new tools and equipment for you to try, a test on the new Dust Guzzler, as well as mini tests on the Crown Mini Revolution hollowing tool and the Ashley Iles/Simon Hope bead-forming tools. And if that wasn't enough, we also have all your usual favourite pages including 'Leader', 'Community News' and 'Next Issue'. All this and more in issue 259! If you'd like to save up to 42% then why not download a digital version of Woodturning to your iPhone, iPad or Android device? Click here to find out how.